Resin Grill Linear Pattern Discounts Apply ! Finally, a bathroom wall vent that will never rust. These decorative air grilles will add a clean, crisp, updated look to any room in your home or office. The bathroom wall vents are handmade in the USA, so their quality can’t be beat. Our decorative air grilles are cast from a low VOC polymer allowing them to be durable while still being environmentally friendly to manufacture. The polymer used to make the bathroom wall vents has a very high density, meaning these decorative air grilles are resistant to cracks, insects, moisture, corrosion, bacteria, and more. Does your bathroom wall vent need specific screw hole placement? 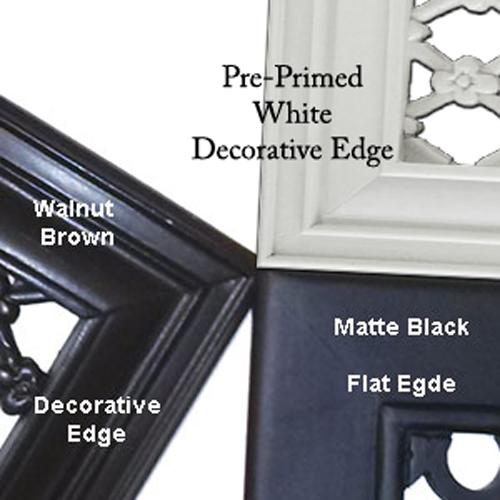 Simply order your decorative air grilles without screw holes. When drilling your own screw holes into the bathroom wall vent, the resin will react similar to wood. Screws will be provided if the grille is ordered with screw holes. Do you want to be able to control the air flow through the vent? Dampers are available, they must be ordered at the same time as the decorative air grilles. Because these bathroom wall vents are made to order, they are non-returnable and cannot be canceled once payment is received. 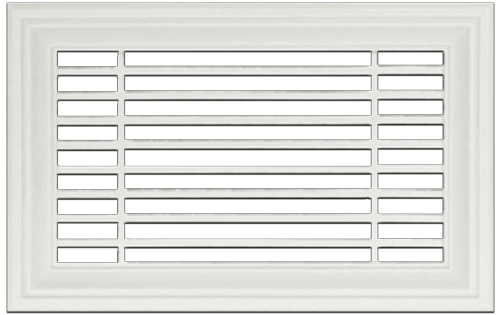 Decorative air grilles are listed based off of the duct holes size they are designed to cover. A duct hole size of 12 x 6 would need a 12 x 6 bathroom wall vent. The outside faceplate dimensions will vary based on size selected and will be approximately 1" to 3" larger than the listed hole size. Want a more decorative design? We have many designs to choose from. Order new rust proof bathroom wall vents for a perfect finishing touch in any bathroom.